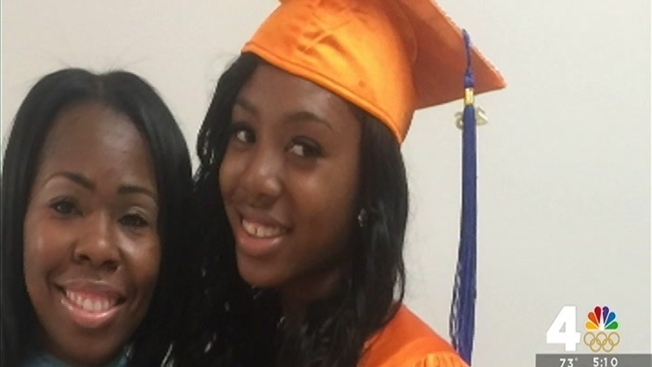 Destyni Tyree graduated from high school after only two years. She has a scholarship to college. She's been a cheerleader. She's been prom queen. And she has a 4.0 grade point average. The new life the 16-year-old is preparing for at Potomac State University in West Virginia is a long way from where she grew up, at the family homeless shelter at D.C. General. Tyree went to school during the summer and on weekends to achieve her goal of graduating two years early. "We not only gave her regular classes, she had online classes and she did Saturday school to make sure that she graduated this year," said Eugenia Young, the principal of Roosevelt S.T.A.Y. High School, an alternative school in Northeast D.C.
Young called Tyree an "outstanding student." Tyree took home a number of awards when she graduated, including the Principal's Award for Academics and the Leadership Award. Tyree said both Young and her mother were supportive of her goal to graduate early, but living in the D.C. General Homeless Shelter was her biggest driving force. "I don't want to live in a shelter when I get older," she said. "I want to better my life, so that gave me the drive to do what I want to do." Tyree will still be younger than many of her classmates when she starts college this fall, but she said she has the same jitters so many young people get upon leaving the nest. She said life at Potomac State will be a "journey," but one she is ready to take on. "I'm scared, I'm excited, I'm proud of myself, all in one big ball," she said. Tyree is still saving money to pay for college necessities her scholarship does not cover, including books. She is accepting donations through a GoFundMe page.